We also have a selection from our Chase Specialist. Before I get to that, just a reminder that you can get through the card selections for today and tomorrow at the Santa Anita Breeders Cup meeting. For full details are Click Here. Two 7f maidens on testing ground, some promise at Warwick before third of nine at Salisbury, but a leading role in this race should demand a good deal more. Reg Hollinghead Male Runners who finished in the first 5 LTO Priced 9/1 or less. There may be a second selection from the Chase Specialist and if there is we will update here at 12.30. So the line up for the rest of the week is now finalised. Tomorrow we have a free install of the Bet Scheduler software, this is the full unrestricted program. Thursday we have a free install of the Bags Beater greyhound software. 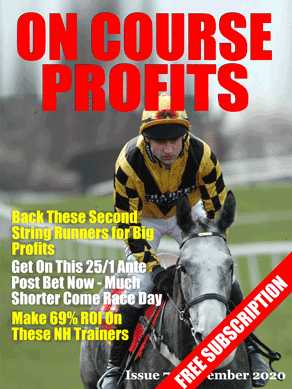 Friday we have a full 7 day trial of a tipping service, no credit card or Paypal required. These three offers will be time limited and you will have to register by 7.00 pm on the day of the offer to secure your place. Today we have another excellent freebie which is being given away to raise awareness of a new product. This one comes from Matt Bisogno, who is one of the good guys in the online betting scene. He's put together a method that shows a profit of 420 points profit over the last 4 years. Matt sells a similar report for £19.95 but he's giving this one away to anybody who registers their email address for more info. means 2012 has started the same way! Comes from the pointing field after a runaway win over 3 miles on testing ground. On first glance this trip would be too short, but she has a flat pedigree and I suspect she is decent enough to make an impact in this race. Travelled like a dream at Kempton back in December and was only just out pointed late on. All best runs have been on good ground and with the dry sunny conditions forecast at the track this should be ideal conditions today. Still only 5 he has more to offer than most in this race and the 16`1 is way over priced in my view.